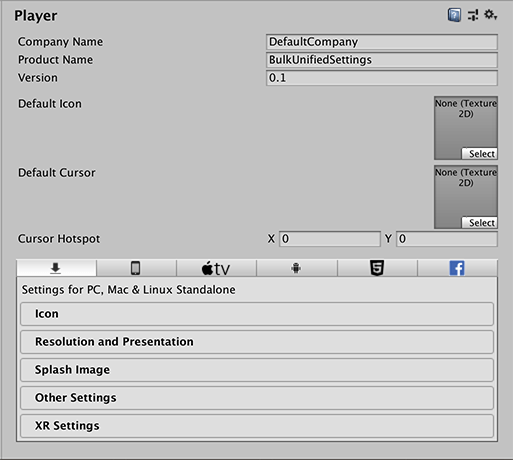 Use the Player settings to set various options for the final game built by Unity. There are a few general settings that are the same regardless of the build target. These are covered below. Splash Image: the image shown while the game is launching. This section also includes common settings for creating a Splash Screen, which are documented in the Splash Screen section. XR Settings: settings specific to Virtual Reality, Augmented Reality, and Mixed Reality applications. Company Name Enter the name of your company. This is used to locate the preferences file. Product Name Enter the name that appears on the menu bar when your game is running. Unity also uses this to locate the preferences file. Version Enter the version number of your application. Default Icon Pick the the Texture 2D file that you want to use as a default icon for the application on every platform. You can override this for specific platforms. Default Cursor Pick the the Texture 2D file that you want to use as a default cursor for the application on every supported platform. Cursor Hotspot Set the offset value (in pixels) from the top left of the default cursor to the location of the cursor hotspot.